The presentation “The Young Michelangelo” by Professor Dr. Norberto Gramaccini was held in the Foreign Affairs Office building of Fudan University yesterday afternoon. It was an interesting introduction to the greatest genius of the Italian Renaissance, Michelangelo Buonarotti (1475-1564). Professor Dr. Gramaccini spoke about the artist’s early career and work. The focus was on Michelangelo’s fascinating sculptures from “Madonna” to the famous “David” in Florence, Italy. The Chinese students were fascinated by Michelangelo Buonarotti’s work and very interested to hear more about Dr. Norberto Grmaacini’s activities at University of Bern. Professor Dr. Gramaccini worked for German Universities in Munich, Trier and Freiburg im Breisgau, as well as for the famous museum Louvre in Paris and the Museum of Arts and Crafts in Hamburg, Germany. He received scholarships from institutes in London, Rome and Princeton. 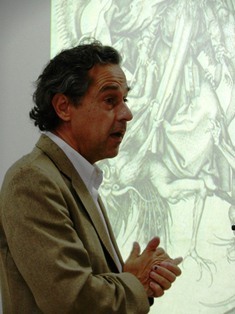 Since 1991 he is Director of the Institute of Art History at the University of Bern, Switzerland.